With this case, baby scales seca 354 can be transported comfortably and safely. The exact fit of the seca 413 provides optimum protection for each pair of scales; the large opening facilitates the packing and unpacking of the scales. An adjustable shoulder strap makes transport easier. The water-repellent nylon surface of the case enhances protection. 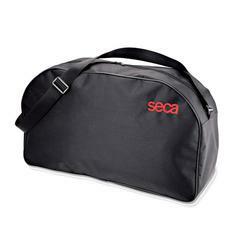 High safety when transporting the seca 383 / 354 with exact fit.